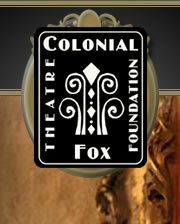 NEWS: Crossland Construction donates $5,000 to the Colonial Fox Theatre Foundation. . .
NEWS: Crossland donates $5,000 to Colonial Fox . . .
Friday, Sept. 20 - 7:45 p.m.
Friday, Sept. 6 - 8:30 p.m.
Friday, August 30 - 8:30 p.m. EVENT: Friday Flix; "The Music Man"
July 19 - 9:15 p.m. EVENT: Friday Flix; "Raiders of the Lost Ark"
June 21 - 9:15 p.m. EVENT: "Bluegrass, Brew, BBQ & You!" Annual benefit dinner and concert - SOLD OUT! June 7 - 6:30 p.m. ARTICLE: CFT Hosts "Bluegrass, Brew, BBQ & You!" . . . ARTICLE: Photo display celebrates heritage . . . ARTICLE: Friday Flix season opens . . . ARTICLE: Environs topic hot for history, real estate . . . ARTICLE: Student films on display at Burg Film Festival . . . EVENT: PSU SAC's 'Burg Film Festival 8:00 p.m. ARTICLE: Colonial Fox marquee taken down. . .
NEWS: Marquee taken down from downtown Pittsburg theater . . . ARTICLE: Iconic marquee removed from historic theater . . . ARTICLE: Colonial Fox Marquee to come down Monday . . . ARTICLE: Theatre, antiques dealears moving ahead with plans for event at the Fox . . . ARTICLE: Renovation begins on theatre's east facade . . . ARTICLE: Work in Progress - The curtain is about ready to rise again, at least on a limited scale, for the Colonial Fox Theater . . . ARTICLE: An historic Pittsburg theater will hold its first public event in nearly 30 years in April. ARTICLE: PSU SAC, CAC announce semester events . . ARTICLE: First public event in nearly three decades set for historic Pittsburg theater. We are indebted to the League of Historic American Theatres for their contribution to the development of our website.